Bold, clear, and concise. The New Standard Of The World doesn’t allow for any leeway or mediocrity. 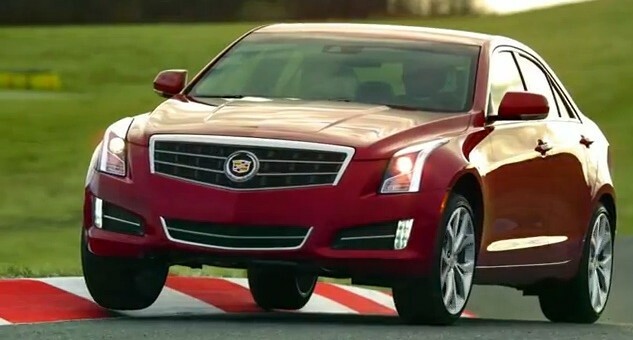 And this is the way a Caddy ad should be. PS: did you notice the Opel billboards in the background? Personally, I don’t think they should be name-dropping BMW or any other brand ever again; or even taking swipes at others. The reason is that the others don’t; they just make an ad about their product and let it do the talking. Those, in general, are the two different approaches to advertising. One is to focus only on your own products; the other is to name drop when appropriate. I think it’s very much so in this situation — as that’s the entire point of ATS. Plus, it will achieve that branding by-product effect of having consumers think of Caddy in the same light as BMW. Readers of GM Authority know what an ATS is, 99.9% of America does not. By telling America who the car was designed to beat, America now knows what the ATS is. Q: Did you see the commercial for the new ATS? A: yeah, I guess Cadillac finally had a 3 series fighter- looks fast! That is why they name dropped 3 series, its an adjective for the size and performance. Great ad, they needed to call out the 3 series – that’s why they made the ATS, this ad falls in line with the ATS episode videos, and people who don’t follow GM or who wouldn’t have looked at Cadillac when they were looking at an A4, a C class, or a 3 series get that comparison put into their heads for them. Nice job. Agrree with the name dropping. Alex…..This is a wonderful ad……very well done and clever too; people will love it! Alex, any word on when there will be more information on the car as far as standard and options? Dan — not until the official RPO codes are released; probably will be in a couple of months, mate.